Maharashtra is the third largest state of India. It is known as the land of saints, educationists and revolutionists, teachers, doctors, actors, actresses, film makers, notable among them being Mahadev Govind Ranade, Swatantraveer Savarkar, Savitribai Phule, Bal Gangadhar Tilak, Dadasaheb Phalke, Dada Kondke and many others. It has a long history of Marathi saints of Varakari religious movement, such as Dnyaneshwar, Namdev, Chokhamela, Eknath and Tukaram which formsthe one of bases of the culture of Maharashtra or Marathi culture. Maharashtra is also known for its purogami culture which translates as reformist or forward culture which was started by earlier saints and led by Mahatma Phule, Shahu Maharaj, Babasaheb Ambedkar in modern times. Maharashtra has huge influence all over the world of 17th-century King Chatrapati Shivaji Maharaj of Maratha Empire and his concept of Hindavi Swarajya which translates to self-rule of people. The state of Maharashtra spans multiple cultures which includes cultures related to Hindus, Muslims, Buddhists, Sikhs, Christians, etc. Lord Ganesha and Lord Vitthal are the traditional deities worshipped by Hindus of Maharashtra. Maharashtra is divided into various regions, such as Marathwada, Vidarbha, Khandesh, and Konkan. Each has its own cultural identity in the form of different dialects of Marathi language, folk songs, food, and ethnicity. About 79% of Maharashtrians are Hindu, and there are significant Muslim, Christian and Buddhist minorities. The Maharashtrian culture consists of people from all a vast majority of religions. Due to it being huge areawise, many sub-regional cultures also exist in Maharashtra. The sub region of Vidarbha, was earlier a part of Madhya Pradesh, hence it has that influence upon its culture. There are many temples in Maharashtra, some of which are thousands of years old. These temples are constructed in a fusion of architectural styles borrowed from North and South India. The temples also blend themes from Hindu, Buddhist and Jain cultures. The temple of Vitthal at Pandharpur is the most important temple for the Varkari sect. Other important religious places are the Ashtavinayaka temples of Lord Ganesha, Bhimashankar which is one of the Jyotirling (12 important Shiva temples). Near Aurangabad are UNESCO World Heritage Sites and famous tourist attractions. Mughal architecture can be seen in the tomb of the wife of Aurangzeb called Bibi Ka Maqbara located at Aurangabad. Mumbai is the capital of Maharashtra and has humid climate throughout the year. The Gateway Of India, Chhatrapati Shivaji Terminus, Shaniwar Wada, Agakhan Palace and Deekshabhoomi are some of the historical monuments. Maharashtra has a large number of hill, land and sea forts. Forts have played an important role in the history of Maharashtra since the time of the Shivaji Maharaj. Some of the important forts in Maharashtra are Shivneri, Raigad, Vijaydurg, Pratapgad, Sinhagad. The majority of the forts in Maharashtra are found along the coastal region of Konkan and the adjoining Sahyadri ranges. Marathi Hindus revere many religious figures. Among the figures who originated in the region are Banka Mahar, Bhagu, Damajipanth, Kanhopatra, Karmamelam, Nirmala, Sadna, Sakhubai, Satyakam Jabali and Soyarabai. The people of the state wear different colorful types of costumes, and there is variation in dance and music according to people's specific localities. Dance forms like Powada, Banjara Holi Dance, Lavani, and Koli are popular in Maharashtra. Traditional clothes for Maharashtrian males include the dhoti, also known as Dhotar, and pheta, while a choli and nine-yard saree locally known as Nauwari saadi or Lugda is for women. Traditional clothing is famous in rural areas while traditional people from cities also wear these clothing. These clothes are worn by Maharashtrians while performing various festivals. Vada Pav is one of the original dishes of Maharashtra. Sweet foodstuffs like Puran Poli and Shrikhand are considered to have originated from Maharashtra. The Konkan and Varadi cuisines are popular with tourists. 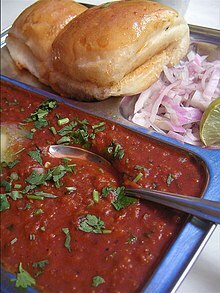 The specialty dishes of Maharashtran cuisines are often strong in pepper and spice; well-known dishes include vada pav, misal pav and Mumbai chaat and puneri missal, selucha chana. ^ "Sant Bhoomi Maharashtra". Retrieved 21 November 2015. ^ "Maharashtra forward culture". Retrieved 21 November 2015. ^ "Shivaji Maharaj, Founder and an Ideal ruler of Hindavi Swarajya". Retrieved 21 November 2015. ^ "Maharashtra latest caste/religionwise population demographics". July 2016. Retrieved 15 September 2017. ^ "Important facts about Vidarbha". ^ "Temples of Maharashtra". Retrieved 15 September 2017. ^ "Top 12 Shiva temples in Maharashtra". Retrieved 15 September 2017. ^ "Ajanta Caves". Retrieved 15 September 2017. ^ "Ellora Caves". Retrieved 15 September 2017. ^ "Bibi Ka Maqbara". Retrieved 15 September 2017. ^ "Top 25 monuments in Maharashtra". Retrieved 15 September 2017. ^ "Folk dance forms of Maharashtra". Retrieved 15 September 2017. ^ "Vidhi Jhaveri" (August 2017). "Traditional Maharashtrian dresses". Retrieved 15 September 2017. ^ "Food diaries: Maharashtra food and cuisine". Retrieved 15 September 2017. This page was last edited on 25 March 2019, at 16:57 (UTC).